There are several ways to show your patriotic pride, but few are as elegant as our Solar USA American Flags. You'll get three of these distinctive flags in this set, giving you plenty of ways to decorate your garden or line a walkway in your yard. The red, white and blue solar flags look beautiful during the day as they gather the sun's energy. That solar power then illuminates them each night so they can shine bright with patriotism. Thanks to built-in solar panels and auto-sensors, these solar American flag stakes are incredibly easy to set up and use. 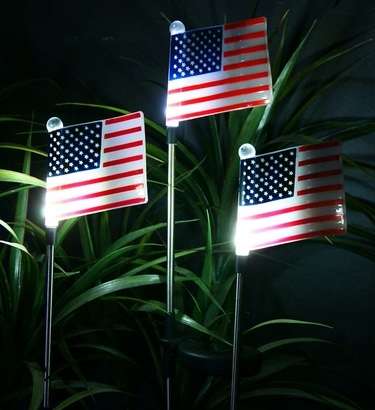 Combine our solar flag lights with other USA-themed gear from GardenFun for a truly patriotic look. 5"L USA American Flags, 33" tall stake. Durable plastic painted flags, metal garden stake. Perfect for lighting patriotic gardens and walkways. Auto-sensor activates the LED lights automatically at dusk. Makes an awesome patriotic solar garden gift!